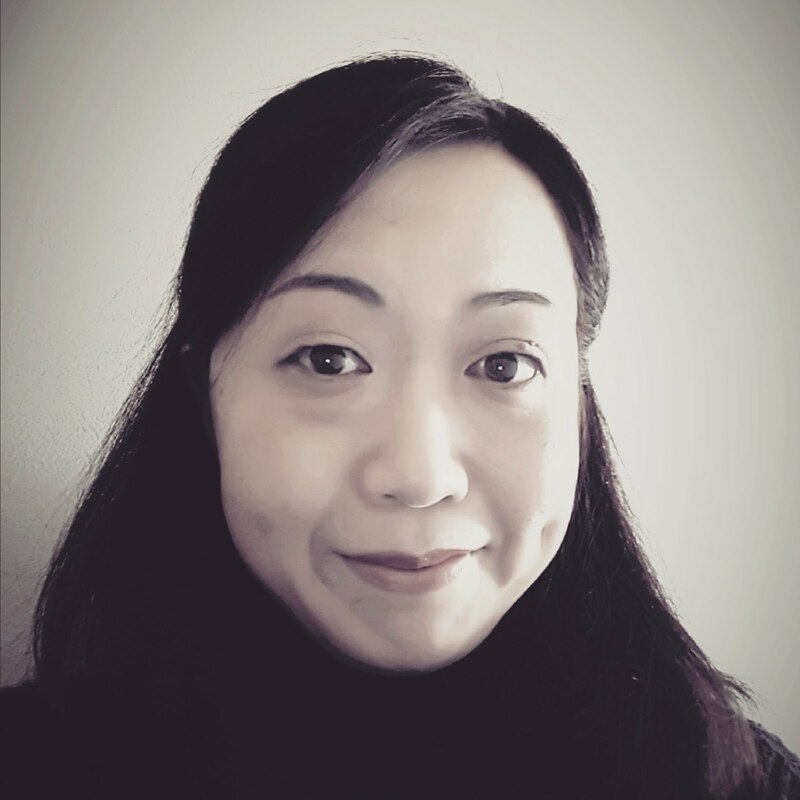 This week Makiko Jones is a challenge host at Flourishes Timeless Tuesday Challenge(FTTC 36)!! 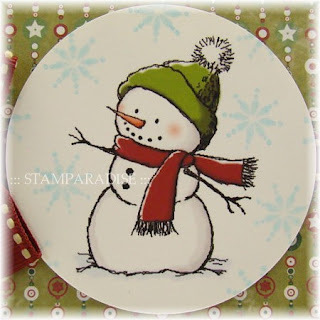 She is so talented stamper as you know, and I love her fabulous creations. So I can't help participating in this weeks challenge!! She is challenging us to make a card/project for a woman and to use pink as the main color. 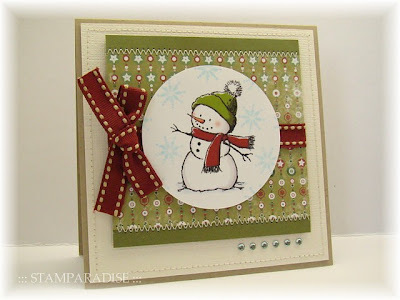 This card was used the sketch from this weeks Mojo Monday(Mojo 107). 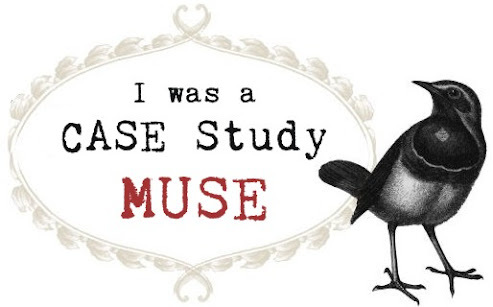 I stamped the image and the sentiment with Jumbo Java ink(Versa magic), colored the image with Holbein Artist Colored Pencils, and sponged the edge of circle panel with Ash Rose ink(Versa Craft). I did stitching with sewing machine, and added some gold satin ribbon, lace, and some chino pearls. Thank you for stopping by today. See you! 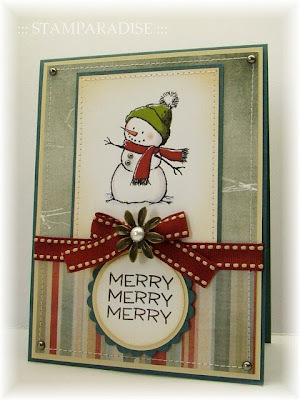 I made this card for 2 challenges, Mercy's Tuesday Sketch challenge (MTSC 42) and Crazy 4 Challenges (Sew Happy!). The witch and the branches are my own hand-carved stamps. 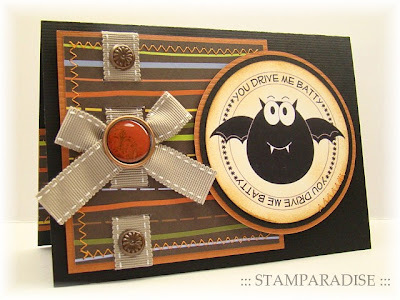 The bat and the jack-o'-lantern which have been stamped onto the circle panel are from Happy Halloween set (Hero Arts). 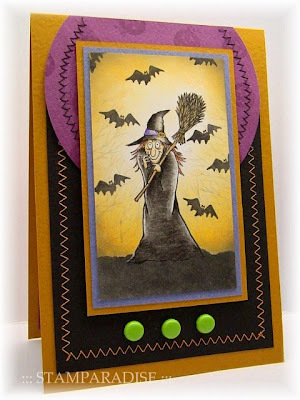 The witch was colored with Holbein Artist Colored Pencils and Meltz Pen. The background of the focal panel was made with masking and sponging techniques. 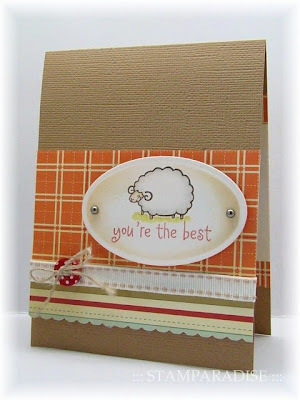 I did zigzag stitch with sewing machine, and added three brads to finish the card. 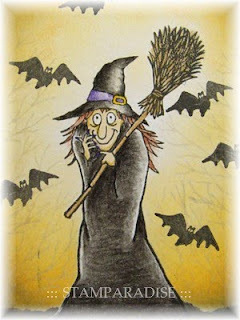 This morning, my daughter found this card on my desk and said, "This witch looks so spiteful! And..... these brads look like green peas. Does she like green peas?" Let me think... I don't know, but I hope so. lol! Thank you for stopping by today! See you! 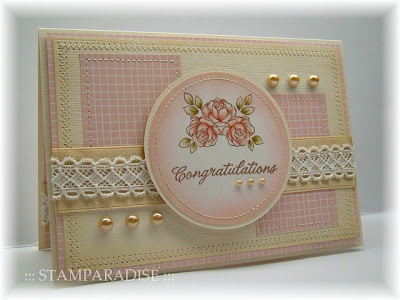 This card is for Mercy's Tuesday Sketch Challenge (MTSC 41) and this weeks ABC challenge (E is for embossing). I carved a new rose stamp again! Please don't ask me how many rose stamps are in my stamp box. lol! 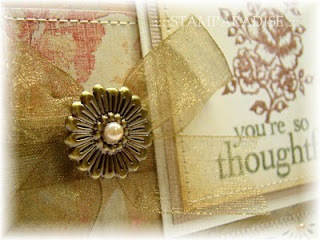 I stamped the image and the sentiment, and heat embossed them with clear embossing powder. The edges around the main panel were sponged with Vintage Photo ink (Distress Ink). I matted and layered each panel, and did stitching with sewing machine. 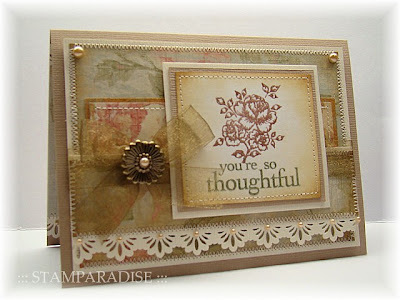 For finishing the card, I added some Chino pearls, organza ribbon, and a metallic brad. Originally there was a small clear rhinestone in the center of this brad, but it had came off. It was an accident, but I got a chance to put a chino pearl into there. lol! Thank you for stopping by today! Have a nice weekend. Paper: Bazzill, K & Co.